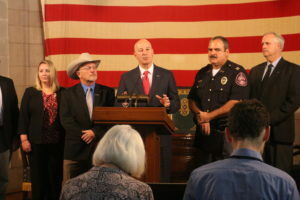 Governor Pete Ricketts, the Nebraska State Patrol and Nebraska agriculture representatives unveiled new livestock guidelines on October 15 aimed at emphasizing safety and improving collaboration between law enforcement and Nebraska farmers and ranchers. These guidelines include development of a Livestock Hauler Standard Operating Procedure (SOP) that Nebraska State Patrol and Nebraska Department of Agriculture adopted to harmonize procedures when these situations arise. Preferred communication channels move between the State Patrol, Department of Agriculture, local resources and the livestock owner, depending on the situation. Protocols that ensure animal welfare have been identified, such as the opportunity to be escorted within 30 minutes from where a hauler is stopped to accommodate offloading the livestock or poultry. In addition to an SOP, the group published best practices for handling different species of livestock and poultry, and a livestock hauler checklist that will help the livestock industry be effective partners in implementing the SOP. Each of these pieces will be incorporated into law enforcement and livestock industry training efforts. 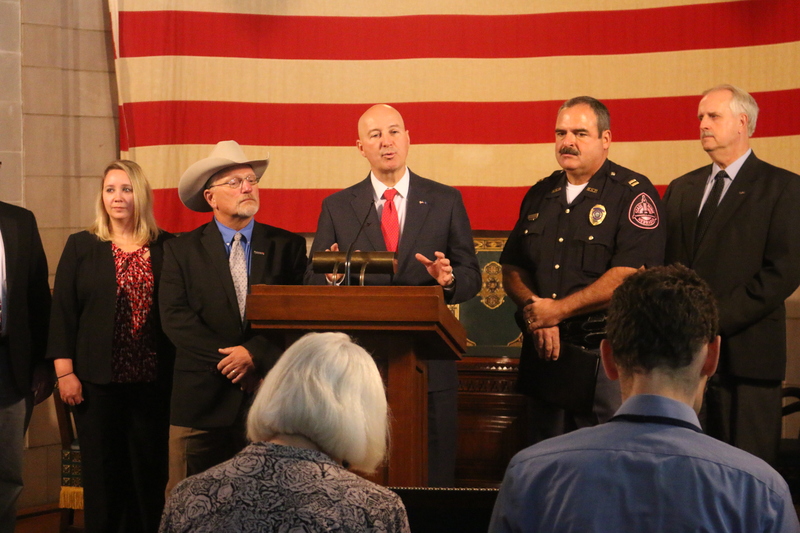 Joining Nebraska Governor Pete Ricketts for the announcement of new livestock hauling guidelines were Rod Johnson, Nebraska State Dairy Association; Chelsea Kramer, Nebraska Department of Agriculture, Mike Drinnin, Nebraska Cattlemen; Governor Pete Ricketts, Captain Gerry Krolikowski, Nebraska State Patrol, Al Juhnke, Nebraska Pork Producers Association and Rob Robertson, Farm Bureau. This working group also found other ways to collaborate and share information. Access to Livestock Emergency Response Plan training is being coordinated through this group. So far, more than 25 individuals in Nebraska have been trained, many who were law enforcement officials. Moving forward, the working group has identified an opportunity to apply for federal grants to purchase and supply livestock emergency response trailers that could be positioned throughout the state and made available when an emergency arises. Gov. Ricketts encouraged this pro-active collaborative work across several state agencies as well as with the agriculture representatives. Numerous head of livestock and poultry are transported across Nebraska on a daily basis. It is critically important for livestock and poultry haulers to obey transportation laws to ensure the safety of drivers, animals and others on the road. Occasionally, circumstances arise that may require the livestock or poultry to be escorted and/or off-loaded. This could occur because of an accident that incapacitates the vehicle, or it could be the result of an out-of-service violation after an inspection. The guidelines will be distributed to all parties and are available to download here.